Our latest interviewee is Barkley Booker, a Stage III colon cancer survivor who was declared cancer-free just a few months ago. 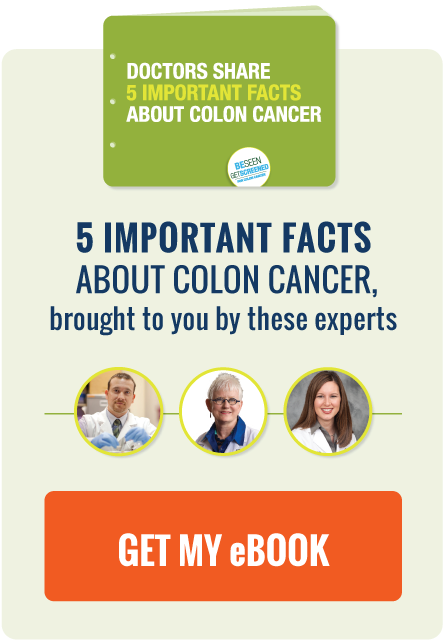 BSGS: Can you tell us about your personal experience with colon cancer? I was 37 years old when I was diagnosed with Stage III colorectal cancer in September 2012. It was a complete surprise to me; I had no family history or any risk factors for the disease. I was very lucky in that I followed up on the one symptom I experienced, which was rectal bleeding. I consulted a gastroenterologist who recommended a colonoscopy. Following the procedure, my doctor told me she found a large tumor that was most likely malignant. The next day I was admitted to the hospital due to heavy bleeding. This is not a normal side effect of a colonoscopy. However, I consider it a blessing because all of the doctors I was scheduled to see as an outpatient came to see me during my three-day hospital stay, and I was able to have CT and PET scans done immediately. The scans showed no sign of metastasis, and that was the best news I could get. I then began learning as much as I could about the disease and the various treatment options available. I was very fortunate to have an amazing amount of support from family and friends who helped me make the difficult decisions about which courses of treatment were the best for me. We interviewed several doctors, both in and out-of-state and from various specialties to compare opinions and treatment options. I chose Kelly Finan, M.D. as my surgeon and Kelly Schmeekle, M.D. as my oncologist -- both located in Baton Rouge. Initially there was difficulty determining the staging of my cancer, a factor that is extremely important in determining what forms of treatment will be required. The doctors said that only a surgical procedure could give them clarity. Post-surgery, it was determined I had Stage III cancer with the involvement of four lymph nodes. This meant I needed both radiation and chemotherapy. I was humbled each time I entered the chemotherapy suite at Mary Bird Perkins – Our Lady of the Lake Cancer Center. There were so many people there in need of care, including some whose prognosis was not as positive as mine. It made me thankful that my cancer was manageable. I made many new friends--some who survived and some who did not. The chemo nurses were amazing. They treated all patients with compassion and dignity. I didn’t feel like a number or a burden. They held my hand if I cried, and encouraged me when I didn’t think I could get through the treatment. I cannot say enough good things about them. My case was difficult at best. I had unexpected side-effects that were debilitating. Dr. Schmeekle was patient and caring, especially toward the end of my chemo treatments when I didn’t think I could keep going. She held my hand and reminded me of the reason I was fighting to stay alive—my two daughters. Her support gave me the strength I needed to finish what I started. I completed my treatments as prescribed and I am forever grateful to her that I did. The last scans I had in December 2014 were clean, showing no signs of cancer. I asked Dr. Schmeekle if that meant I was in remission and she said no, it meant I was cured. I am working hard in both physical and occupational therapy, trying to get my body strong enough to go back to work full time. I thank God for guiding me in all of my decisions throughout this process, and I believe the results prove the power of prayer. The best way to avoid colorectal cancer is early detection. I listened to my body and went to the doctor as soon as I noticed something wasn’t right. A colonoscopy was much less invasive than radiation, chemo and surgery. I am very thankful for the doctors I chose, and I am very happy with the care I received. I want people to know that we have extremely caring and gifted doctors right here. The entire staff at Mary Bird Perkins – Our Lady of the Lake Cancer Center and Baton Rouge Colon Rectal Associates is amazing. I consider many of them my friends to this day. BSGS: What were some of the greatest obstacles you faced and most important lessons you learned throughout your cancer journey? Chemotherapy was my greatest obstacle. To have my children watch me suffer from its side-effects was the hardest part, but we are closer now than ever because we had to pull together as a family. The most important thing I learned through this journey is that life is a series of choices. No matter what you are facing, you have a choice. You can choose to be happy or not; sad; angry; and so on. Each day I wake up and choose to be happy, choose to fight, choose to live my life the best I can. I don’t ask, why me? I thank God each morning for allowing me another day. BSGS: There is a growing body of evidence that more younger people are being diagnosed with colorectal cancer. What is your advice for those who believe they may be at risk for the disease? My advice is to speak openly with your doctor and get screened if you have any symptoms or risk factors. BSGS: Why do you think colon cancer is regarded as the “most preventable, but least prevented cancer?” What can people do to change this label? It is the most preventable because if caught early it is treatable. In fact, if caught early enough, polyps can be removed before they become cancerous and no further treatment is necessary. The stigma associated with colonoscopies is what I think keeps people from getting them. I think more education about colonoscopies could help. This test was the easiest part of what I went through. Ignoring signs and symptoms or being fearful of a colonoscopy can lead to grave consequences. BSGS: In your opinion, why is it important to be educated about colorectal cancer and available screening options? I don’t think most people realize how preventable this cancer is. If the doctor finds a pre-cancerous polyp and removes it, it can’t grow into cancer. You can’t know if you have polyps unless you have a colonoscopy. A colonoscopy is easy; you get to sleep right through it. I had the same reservations most people probably do, but I got over them and I am thankful every day that I did. BSGS: If you could offer advice to a young person grappling with a recent colon cancer diagnosis, what would you say? Educate yourself about the disease and the treatment options. This makes you an active participant in determining your course of care. The more you know the more informed choices you can make. Do NOT Google your cancer or survival rates as each person is different. Ask your doctor for educational materials and stick to those. Interview multiple doctors in each treatment specialty you will need. Know the questions you want to ask and write them down. Go with the doctors you trust and do what they say. My faith and wanting to watch my girls grow up is what got me through. Identify what is important to you and keep it in your mind every day. Wake up each day and find something you are grateful for no matter how badly you feel. If you get overwhelmed, do something for someone else less fortunate than yourself. Doing for others always resets my perspective. BSGS: How did colon cancer change you and your outlook on life? Having cancer strengthened my faith in God and made me appreciate life even more. When life gets overwhelming I just remind myself that it beats the alternative. I consider myself lucky to be here. Life is short, I am so thankful to be alive. BSGS: What are you doing to raise awareness of this disease? I have just started on that path sharing my story with others. I hope by reading the words I have written here, people who are afraid or embarrassed will get over it and get screened. It could save their life. BSGS: Lastly, what is one thing you would like people to take away from your story? No matter how well you take care of yourself colon cancer is a possibility. Pay attention to your body and get screened if you have any symptoms.